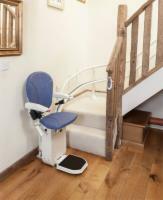 The AmeriGlide Platinum Curved Stairlift is designed for curves and landings that a typical stairlift can't manage. Users up to 264 pounds can enjoy regained access to the upper levels of a home without the strain or risk of climbing steps. Also perfect for users who can climb steps but choose to use a lift part of the time, this model comes with a remote control that will allow you to call the lift to you or park it. The design lets the seat and footrest fold in so that you and others have easier access to the steps, as well. Safety features like a key-switch below the armrest let you lock the stairlift so children or unauthorized users can't operate it. Security sensors also detect anything on the stairs and will stop the chair to avoid accidents. Options like an ergonomic seat and a powered footrest raiser offer you choices so that you end up with a lift that fits your life. For the ultimate in safety and convenience on your staircase, choose the AmeriGlide Platinum Curved Stairlift.